We at CMA love asking “what if.” Imagining is one of our favorite pastimes. A couple of years ago we asked ourselves, what if we took the experimental spirit that fuels our Chase Center for Creativity and applied it to art that speaks to social issues relevant today? What could creative activation and social engagement look like at the museum? These and similar questions had been churning through our minds for a few years when we got the exciting news that CMA had been awarded funding from the Institute of Museum and Library Services, Museums for America program to launch the Center for Art and Social Engagement. We had long been experimenting to foster visitor conversations about social issues through art, but the IMLS funding would kick us into the next gear. As you might imagine, the news was thrilling and a little bit scary. Now came the hard part. The first step was asking ourselves, what do we mean by ‘social engagement,’ and how do we hope visitors – and the museum – will be different as a result of this initiative? These early conversations were exciting, but broad; our imaginations were pulling us in a million directions. So almost on a whim, someone suggested we pull out CMA’s primary book of social commentary art, In the Eye of the Storm: An Art of Conscience, and open it to a random page. We opened to George Tooker’s Lunch and began, as museum educators always do, to notice. We surfaced dozens of ideas that could point us toward a theme. The one that rose to the surface was isolation. The work is packed with figures, apparently seated in rungs, slouched forward and looking down. Although they are crowded together, each seems alone. Some appear to be holding sandwiches, one a cup of coffee. Visitors sometimes remark that the posture and feeling of disconnection reminds them of people on their cellphones. Both isolation and alienation impact us all of us, in different ways, that are personal, social and political. We are living in times characterized by superficial connections and profound loneliness; a recent study found that 1 in 5 Americans “always” or “often” feel socially isolated. Moreover, while the rights movements of the past decades have achieved undeniable gains, persistent power imbalance means that massive inequities remain a societal toxin. When you visit the Center for Art and Social Engagement, we hope you will have the courage to consider your own experiences of loneliness, isolation, exclusion, and to imagine the lives of others. We have mined the collection to find works that speak to different aspects of isolation and exclusion; we encourage you to slow down with them. We will also be launching a special tour and hosting creative encounters with artists around this theme – so stay tuned for program announcements. We also hope you will build connections with other people through experiences in the Center. We have included games – some familiar, some created especially for CASE. These will help you connect with someone you visit the museum with or perhaps a stranger you meet in the gallery. Some will also help you think differently about some of the structures that push people to the margins and limit their wellbeing. Lastly, we hope visiting CASE will inspire you to take action, for yourself and for others. We have crowdsourced some tips for fighting isolation, and included local resources for mental health and other kinds of support, as well as, organizations that combat social exclusion and that need your help. Loneliness and exclusion thrive when we are afraid to name them. We hope this inaugural installation of the Center for Art and Social Engagement will help us break those taboos, build new connections, and engage in new, creative, relevant ways. 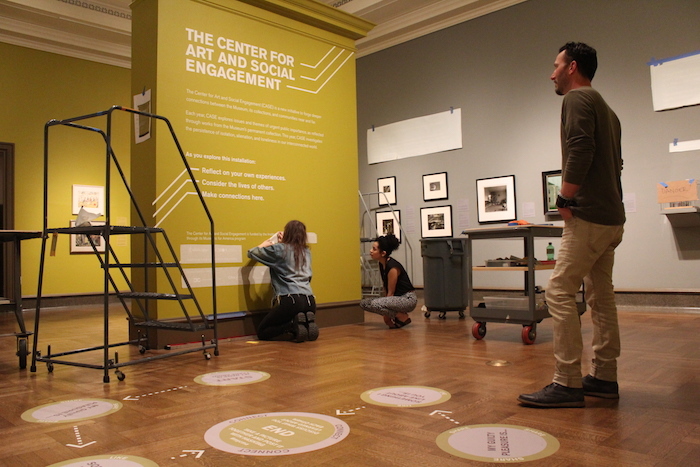 The Center for Art and Social Engagement is funded by a grant from the Institute of Museum and Library Services. -Jen Lehe, CMA Manager for Strategic Partnerships.